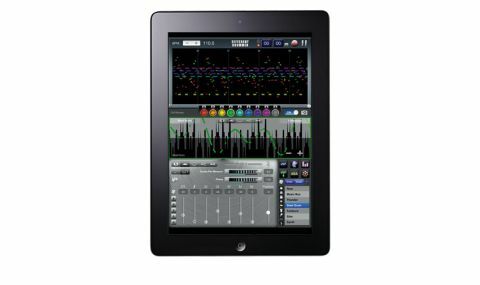 An innovative app that when used in conjunction with your DAW could prove a powerful rhythm design tool. Lives up to the name. Fun to use. Few sound shaping options. Expensive. When Different Drummer was first released in 2012, it carried a ridiculous £200 pricetag. Now down to a more sensible £35, it's a much more viable release, albeit one that still sits at the higher end of the App Store price range. "An innovative eight-channel drum machine, Different Drummer eschews conventional step sequencing "
An innovative eight-channel drum machine, Different Drummer eschews conventional step sequencing in favour of what Techné call Cyclophone Technology. A DD 'patch' is called a Wave Set, and it comprises eight Drum Waves, which are triggered samples (from the built-in library or imported), the playback timing and pitch of which are governed by five Control Waves. These are basically touch-controlled sine wave LFOs, each generating a fundamental wave and six partials that enable complex rhythmic shapes to be designed. It's hard to describe but great fun to use, and Wave Sets can be strung together to make complete 'songs'. The interface is fairly intuitive but slightly awkward in places - standard iOS On/Off switches to activate sounds, for example. Plenty of graphical feedback is given, with the effect of the Control Waves clearly visible in the central Wave Display and the overall pattern laid out at the top. It's also packed with randomisation such as automated random sequence morphing. Different Drummer certainly lives up to its name - there's nothing else quite like it. It's very much about rhythm and pitch, though, with little in the way of sound-shaping onboard - ie, no filter or effects beyond a rather crummy global reverb. However, the Cyclophone concept works really well, and with the app able to export MIDI files (as well as recording it's own output to WAV and feeding other apps via AudioBus), it could be a powerful rhythm design tool in conjunction with your DAW. It's just a shame it doesn't have any kind of synthesis or sample manipulation. So, is it worth the money? Well, if it was a desktop app, no one would question the price, so it could be argued that it is, yes. In the inescapable context of other iOS music apps, though, it feels about 15 quid too high to us.